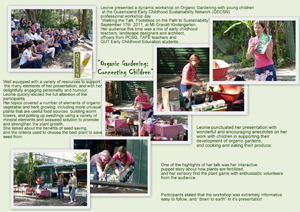 Leonie presented a dynamic workshop on Organic Gardening with young children at the Queensland Early Childhood Sustainability Network (QECSN) professional workshop day. Well equipped with a variety of resources to support the many elements of her presentation, and with her delightfully engaging personallity and humour, Leonie quickly elicited the full attention of the participants. Her topics covered a number of elements of organic vegetable and herb growing, including more unusual plants that are useful food sources, building worm towers, potting up seedlings using a variety of mineral elements and seaweed solution to promote and stregthen the plant growth. She talked about the benefits of seed saving, and the criteria used to choose the best plant to save seeds from. Leonie punctuated her presentation with wonderful and encouraging anecdotes on her work with children in supporting their development of organic gardens, and cooking and eating their produce. One of the highlights of her talk was her interactive puppet story about how plants are fertilized and her sensory find the plant game with enthusiastic volunteers from the audience.